I’m not sure yet how I’ll finish out the piece. 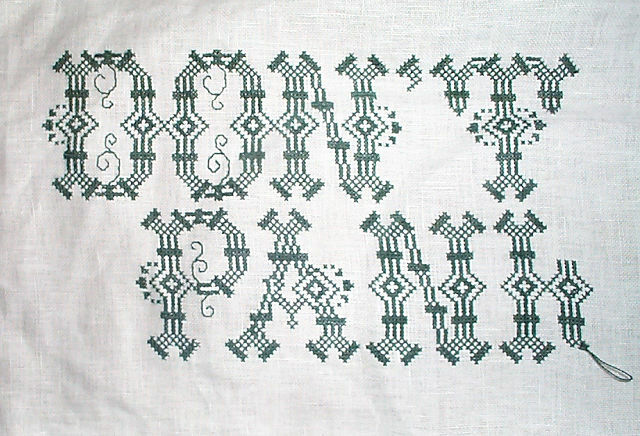 Whether I’ll add some spindly double running stitch curlicues to square out the sentiment, to coordinate with the ones built into the closed letters of this font, or if I’ll do something else. But whatever it is, this small doodle is almost done. The remainder of my holiday weekend will be spent cooking our spin on the usual holiday fare (turkey with chestnut/prosciutto/leek/mushroom stuffing; Chinese broccoli with garlic, glazed sweet potatoes; pumpkin chiffon pie; black bottom pecan pie); enjoying the company of Elder Daughter, home from college and flush with her new semi-independence; finishing off both samplers for hanging; and not being at work. Things I am thankful for: good children, a husband who likes to cook, that deadlines do end. All the best to the few who follow here, may your holiday season be warm and happy. Happy Holiday to you as well. Enjoy the time off from work and having your family together for a few days. Another pumpkin chiffon pie family — awesome! I was beginning to think we were the only ones. Hope it was yummy. Given the feel of the piece, perhaps adding some curlicues and so forth to specifically *not* square it out–make it feel off-balance and teetery. Black Bottom Pecan Pie??? Do tell!